Well, we didn't win the Disney Trivia night, but we had a lot of fun, and I did win the costume contest! Surprisingly enough, I think it's the first time I've ever actually won a costume contest, so that was nice. I'm also debating about switching out my 1912 dinner dress in my CoCo lineup for Rapunzel, instead. The real issue is transporting that wig when I already have so many other costumes to pack! Oh, and I did no sewing today. I better get on that tomorrow! So that means I'm on target for now, which is good. However, I have an audition mid-day tomorrow, and then I'm going to Disney Trivia night, which will likely mean very limited sewing time. And I have to put the waistband on Elsa so I can send that off on Friday. Luckily, the rest of Friday will be a sewing day, so maybe that will make up for tomorrow. Oh, and I'm going as Rapunzel for the trivia night tomorrow, but the rest of my team is planning to wear ears. I can't fit the ears over my wig, so naturally, I decided to throw together some ears to match my costume! They're made of the dyed brocade left over from the bodice, with leftover piping along the edge. I used a Mickey hat ear as my template for the shape/size. Inside is one layer of batting and one layer of buckram. I serged the bottom closed, and hid the serging underneath vintage ribbon bows on the front, and yellow flowers on the back. The tiny rosettes are actually functional - they're on wires, and help to stabilize the ears, which also have pin curl clips along the bottom of the ear. They seem to stand alright on the wig head, but hopefully they'll actually make it when I wear them for real tomorrow. Especially since I'm going to have to put them on once I get there, using my car window for a mirror! My etsy shop is live! Okay, granted, there's not much there yet, but I'll be adding more soon. Right now, it's just my Rapunzel and Anna embroideries, but I'm planning to add kids Disney-inspired playsuits soon, too. I'm also thinking of selling some of the vintage hats I never use, too, and maybe even some old costumes that I no longer wear or fit in, but that probably won't happen right away. I finished all the quilting on Flynn, tacked down the back flange in a few places, and added the armseye flanges. Then I antiqued the studs for around the armseye with black nail polish, and studded the doublet. So finally, on to the clasps. I thought those clasps were going to be the death of me. They were by far the most difficult part of the entire project, and took probably 6-7 hours to complete. My bf found pinchy clasps and buckles at the store, and then he worked on taking them apart and totally changing the makeup of the buckles. I wish I had a before/after picture of them, but he basically took some sort of metal grinder, and ground off the back piece to make them just into hooks. He also took the middle part out of the buckles. Then I had to make little strips to hold the end of the buckle to another fabric backing piece, much of which had to be done by hand, because the tubes wound up being too narrow, yet too thick to turn with my tube turners. On the other side, I had to make enclosures for the hooks to that all that would be seen was the rounded end of the hook. So in each piece, I made an eyelet, sewed up the sides, inserted the hook through the eyelet and stitched the hook to the enclosure, and then closed it up. Then of course, all these pieces had to be sewn to the doublet. Naturally, while sewing all the pieces to the doublet the morning of my party, I ran out of thread. Luckily, my bf was with me and ran out to go buy some, so I was able to finish without too much stress. I also sewed three snaps on the shoulder of my Rapunzel bodice and on my wig, which was a huge help. It really lightened the load. I'm a little worried about how hot it's supposed to be at Disney on Halloween, but at least my neck won't get tired! I wasn't entirely pleased with how the bodice wound up looking on me, but I don't think I'm going to stress about making any changes before we leave on Thursday. For one thing, I don't think that either a) there was enough boning or b) that it was strong enough. In particular, since I only boned on the seams (though there are a lot of those), there's a place on the front where I really feel it could use more support. 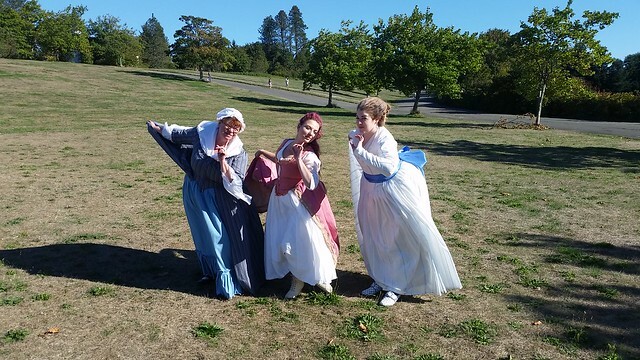 In addition, I didn't give the bodice enough flare at the hips, so it really wants to ride up as I'm wearing it. I had to keep pulling it down throughout the night. But here's what you really care about - pictures! We will definitely need to take more/better pictures. We took a few really quickly before the party, but it started raining, and it turned out that almost every single one my bf took of me were blurry. Silly phone camera. The Rapunzel bodice is done! I piped the armseyes, put the lace on the sleeve hems, cut down the entire sleeve head by 1.25", gathered the sleeve heads, and set the sleeves. Luckily, I did one sleeve first, and checked the fit, because there was just too much length in the front of the pouf. I ripped out a small section of the front of the seam, and reset it about 1.5" lower at the biggest point. Then I just cut that much off the other sleeve before I set it. I'm quite happy with how it is now. I also whipstitched the modestly panel into the front, and changed out the button closure/removed the weird cat-tag on the "satchel" I purchased on ebay. And I dyed a pair of white walking shoes pink. No pictures yet, because I finished all that past my bedtime and didn't feel like lacing up the bodice. So now comes the hard part - the engineering. I want to figure out a way to attach the hanging braid of the wig to my shoulder. I'm thinking the largest size whopper popper I can find. At the same time, though, I don't want to limit my movement when I turn my head, so maybe a whopper popper attached to twill tape? Or does anyone have any ideas? I also want to be able to attach my little Pascal plush to various places on the costume or my bag, so I'm thinking of putting 1-2 large pin backs on his stomach or feet, so that he's moveable from place to place. I worked on the Rapunzel sleeves for a few hours last night, but unfortunately didn't finish them. The ribbon stripes are on, the pouf is attached to the mesh lower sleeve, and the embroidered ribbon band under the pouf is on. All I have left at this point is adding the lace on the hem and setting the sleeves into the bodice. I think they're actually way to huge and poufy at the top right now, though, so I have a feeling I'm going to cut the length of the top of the pouf down by at least 1-2". I want to try on the bodice first to make sure, though. I'm going to a Harry Potter trivia night tonight, though, so I doubt I will have any sewing time. But tomorrow, these sleeves and Rapunzel should be completely finished! And then it's on to Flynn. I finished sewing the marabou on the cape last night! I wish mine was nice and fluffy like other people's, but now I know to use Joanns boas instead of this crappy stuff from online. I think it still looks passable, anyway, and I might wind up selling it, so I'm not too worried with how it looks. I sewed it on with a running stitch, taking large stitches on the boa side, making sure I went up through the rope of the marabou each time, and taking small stitches on the lining side. I'm planning on replacing the bow with larger ribbon, but this was the widest white ribbon I had on hand. I also started sewing the marabou on the muff cover. I think I'm about 1/3 done at this point, so depending on my mood tonight, I'll either go back to the Rapunzel sleeves, or try to finish the muff cover. I've definitely been in a hand-sewing mood lately. I also took a little time to hot glue faux flowers onto barrette clips for Rapunzel. I think I did 16 total. I just hope the clips stay in her hair! 12 of them are alligator style clips, and when I tried them in her hair, they still seemed quite slippery. The other four are claw style, so those should be just fine. So, I may not have sewed much this weekend, but I did style my Rapunzel wig! It started with this wig, which I got on ebay. It was basically a blonde wig (of a nice quality and color) that was braided into one large braid. However, it lacked all the detail that Rapunzel has on her head. So I unbraided the wig, and wound up using nearly two packs of a jumbo #24 kanekalon braid, and about 1.5 packs of a silky #613 braid. (Of course, I bought a ton extra, so now I have three unused #24 blonde braids, if anyone is interested in purchasing them off me!) I wound up having to go to three different hair stores to find them. Thank goodness we were down in the Federal Way area anyway on Saturday! Neither braid color was an exact match, but by mixing them all together, I think it works okay. The first thing I did was straighten the two kanekalon braids, since they have that weird frizzy kinkiness in them. I was really pleased to see that it easily straightened out with my flat iron on its lowest 300 degree heat setting. I attempted to make a weft of the #613 to tuck up into a french braid on the right side of the wig. Most of it wound up falling out, though. Note to self (or others) - do not attempt to french braid an app 50" wig. You will probably get very tangled and very frustrated (like I did). Although it looks rather messy, I decided to keep the french braid in (I'm sure it would have been just as bad to attempt to undo it) and do a regular braid on the other side. First, though, I had to do the bang swoop. I was hoping to get it to stand up a bit more than it did, but I think it gives the right overall effect. Unfortunately, I wasn't really thinking about the swoop when I ordered the wig, because this wig has a fixed center part, and only has a skin top underneath the part section. Luckily, I was able to pull some hair over from the other side and make it work. I hairsprayed the top and the underneath side, and then blow-dryed it on high heat, but low air until it dried, keeping my fingers underneath to keep the shape. I think I did that about 4 or 5 times until it got the shape I was liking. I pinned the bottom into place underneath the layers of hair I was going to be using for braiding. For the braid on the other side, I took half of one of the #24s, separated it into three pieces, and braided it into the wig, attempting to blend the colors as I went. It made a nice big puffy braid which is quite pretty, and I pulled a couple pieces from the rest of the wig to help it curve around the back of the neck to the other side. Then I basically tied those two braids into a loose knot, and used a claw clip to fix it in place. There are three claw clips total in the wig. I was hoping to be able to use bobby pins, but the hair is too thick and heavy, so it just pops the bobby pins right back out. Anyone have any suggestions? Otherwise I'm just going to hide the claw clips with flowers. I did do another small french braid alongside the first french braid, but I only picked up three or four pieces into it before it met up with the other braids. The wig came with two tiny braids already done at the base of the neck, and I added two more, which I looped around the larger braids, and then incorporated into the big braid. Once the two larger braids met, I braided them together, weaving them back around to the other side of the head. I found, in braiding the larger braids, that it was very helpful to section off each piece of the braid with small plastic hair ties, to combat the wig's urge to tangle. Once I got to the other side, I added in my other #24 braid and my #613 braid, holding them each by the end (instead of folded at the middle like they normally come). I ponytailed each one separately, and then rubberbanded them again to about half of the wig hair that was hanging down. I separated them all into three pieces, so that each piece was equal parts wig, #24, and #613 in an attempt to blend the colors. I also tried to make sure that the tiny braids were fairly evenly distributed. Then I started the big braid. It was very difficult to do because it was so long! I braided until I got to the end of the wig hair (which was quite a bit shorter, at this point) and then rubberbanded. One of the other alligator clips is also holding the top ends of these two incorporated pieces into place. I didn't do pin curls when I tried it on yesterday, but I will definitely be doing them when I wear it for real. I'm going to try wearing it all day on the day of my Halloween party, so that I will hopefully be able to tell if I can manage the weight when we go to Disney World. At this point, I still need to add all the flowers, and I'm also going to try to rig some sort of snap set up to attach the top of the long braid to my shoulder so that it is not so heavy. And if you made it through all that, here's a few pictures! Is it a bad sign that I already have a post called CADD Again? I hope people aren't fading back off of LJ! There have not been that many posts in the last 24 hours. Come on, people! I need something to keep me amused at work! In any case, I did more marabouing last night. I am now into the hood portion, which I think means I'm slightly more than halfway done. With the cape. Because I still have to marabou the muff once I'm done with the cape! It's definitely slow going, though I'm actually enjoying just hand-sewing in front of the TV. However, I felt like I wasn't being productive enough last night, so at about 9:30, I decided I would cut out the pieces for the mockup of my bf's Flynn doublet. So I did. And I sewed them together. Because productive! It makes me feel like I accomplished something more than just sewing on a few feet of marabou. Which by the way is still disappointingly unfluffy. I guess I'll go with Joanns boas from now on, but it would be a waste to not use this one. I'm actually thinking I might wind up selling this cape. We'll see how I feel by the time it's actually finished. On the plus side, if I need something a little warmer to wear with Rapunzel, this one wouldn't clash horribly with the costume. Thanks for your advice yesterday! I have decided to make a facing, and I'm also changing the lacing to CF. I found a few more examples of it, and although it doesn't seem anywhere near as common as back lacing, I know it will save me a lot of trouble when I'm in the convention center bathroom trying to put my bodice on! At this point, I have cut out all the interlining and outer pieces, serged them all together, and sewed together three of the pieces. Tonight I plan to have them all put together, and I'm hoping that I might have some of the right sizes of boning already in my stash. Since it's unlikely, I'm sure I will be picking up some boning tomorrow. I have to figure out what I want to do as embellishment. I don't think I have much/enough green left to make bias binding or piping, which is too bad, since that is what I would like to do, so I might have to buy more. And while I have a nice cream gathered lace in my stash that I could put around the neckline, part of me is feeling like I should go buy more fringe and use that, since it would carry the fringe up from the skirts. (Would it be weird to layer lace and fringe?) I have a really wide lace I can use for the sleeves, though I need to tea dye it first. I could probably manage that tonight as well. And I think I'm going to lace it up with ribbon, since it's front lacing, so I'll have to check the stash for that. 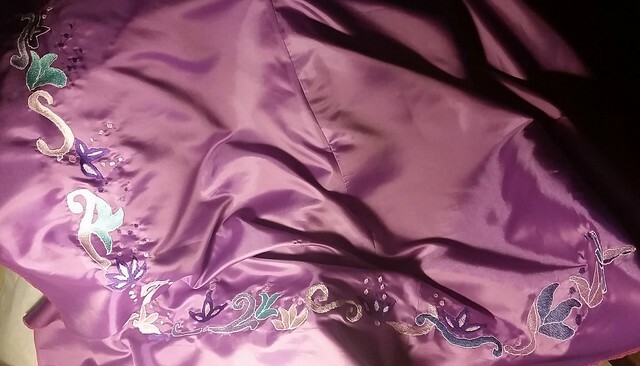 I also did cut out the satin for the Rapunzel sleeves yesterday, too, and serged it to the organdy interlining. I figured I ought to finish off the last of the pink serging I needed to do before I changed the serger to white. The Rapunzel skirt is completely finished, including hooks and eyes. I started on the sleeves, but all I got to was cutting out the interlining of the upper sleeve. That said, the rest should be fairly easy (famous last words). 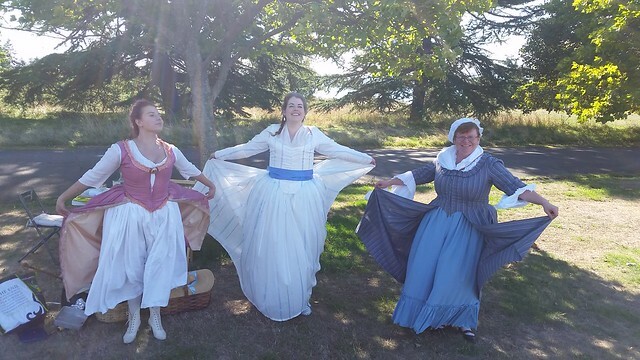 I also realized that my 1830s cotton petticoat (not the corded one) is almost the perfect length for a petticoat. The lace at the hem is just peeking out below the lace on the Rapunzel hem, so I think I might make a small tuck in the petticoat and call it good. However, I may not work on that tonight. Because I woke up in the middle of the night last night (after having a dream about forgetting all my accessories/hair for a ball), and realized that I'm planning to go to Steamposium on the 26th, and there is going to be a ball. However, I was planning on wearing either the plaid 1890s or the green and cream bustle, neither of which are appropriate for evening wear. So now the question is, a) which do I wear? (I'm leaning towards the bustle, because I want to wear it again, and I think the train will fare better at a con than at a museum where there's lots of muggles around). and b) for whichever one I do decide to wear, do I make a ballgown bodice? I think it would be easy enough to make a ballgown bodice for the bustle gown. It would definitely have to be on the simpler side, because time, but I think I have enough ivory left for a simple bodice, and hopefully have enough green to trim it. Now of course, if I were to wear the 1890s, it almost seems just as difficult to make a whole new evening look than attempt to make a bodice that would eveningify that heavy cotton plaid skirt. But am I that crazy? So anyway, when I get home today, I think I'm going to pour through my stash and throw things at Antoinette and see what looks good, and what would be feasible to make in a week. I wish I had more time to sew! On Saturday, we had a small farewell 18th picnic for theladysarah at Discovery Park, near my house. Although it said it was supposedly 80 degrees, we found a lovely shady spot, and there was a constant cool breeze coming off the Sound, so it felt pretty perfect. 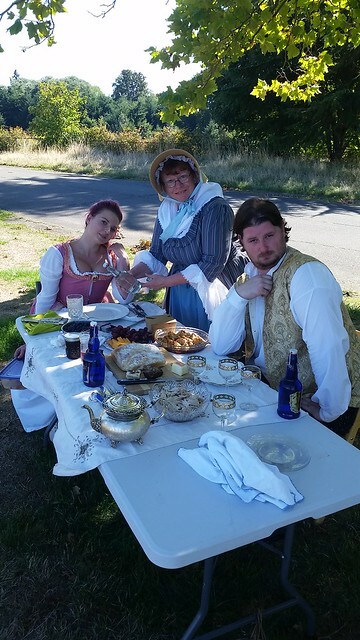 She baked delicious bread and apple dumplings, and we also had chicken, fruit, macarons, and lots of pink lemonade. Naturally, we went all out and dragged table, chairs, china, and crystal into the park, and everything looked absolutely scrumptious! That said, the next time we do an event here, I need a wagon. You have to park so far away from the meadow! I also worked a bit more on Rapunzel this weekend. At this point, the bodice just needs sleeves and to have the "blouse" front panel sewn in, and the skirt just needs to have the lace put on the last 2/5th of the hem. I wound up redoing a lot of the lace on the bodice, because I realized that A) Rapunzel has pink lace at the bottom of the bodice, not white, and B), on the back of Rapunzel's bodice, the lace is faux-chemise trim, not bodice trim. So I did a fair bit of ripping out, but luckily the bulk of it was larger whip stitches, so it wasn't that terrible to redo. The skirt will be finished tonight, and I may also be able to start on the sleeves. I finished putting the lace on the neckline and hem of the Rapunzel bodice. I also pinned the CB "blouse" piece into place, and it fits perfectly! That should be super easy to whip into place, and then I can add the faux buttons down the CB. Though part of me thinks that might just be asking for trouble, whether or not I have a big braid. Maybe that's why you only really see the buttons in the movie once Flynn chops her hair off? I didn't work on the skirt hem. Instead, I was on the phone with Geico for 45 mins, first trying to get them to lower my monthly payment back to where it was last month, and when they were unable to, cancelling with Geico. I shopped around in between the two calls, and found that State Farm was $10 cheaper/month! So now I have new insurance, but no hem. Oh well, hopefully tonight. 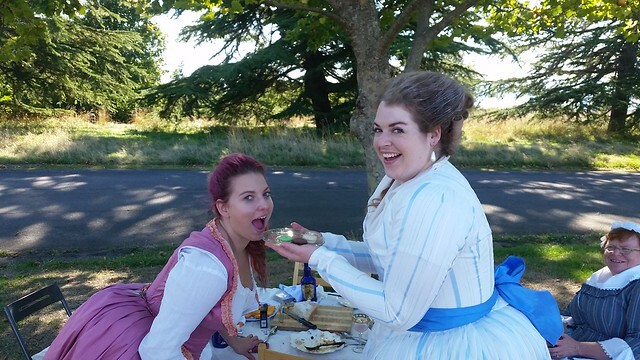 I'm excited because tomorrow my bf and I are having a going-away 18th c picnic for theladysarah. I'm super jealous that she gets to go to Scotland for the semester, but I'll miss costuming with her as well! Okay, not quite, but I did take the decorations out of the storage closet today. All I've put up so far is a little wooden "Boo" hanger, a beanie ghost on top of my TV, and Frank, my vampire on a stake. Of course, the dirt areas around my patio are so shallow that despite the fact I had made a little dirt pile to shove Frank's bamboo pole into, he has already fallen over. So I'll have to find a more secure spot for him. I may put my orange lights up tonight - we'll see how I feel when I get home. The main thing that's preventing me from doing the rest of the decorations is that there are several natural decorations spread around the yard, including a very meancing looking one who has spread his web from my front porch to the bushes. The only reason I haven't knocked him down so far is that he's not blocking any pathways. Spiders that block pathways get killed. I got all the pink ribbon trim onto the hem of the skirt, and I have pressed/pinned half of the hem into place. I had forgotten what a pain it was to do a curved hem on poly satin. There's definitely a lot of wrinkles around the embroidery as well. *Sigh* I seriously don't know why I did this project with this fabric, except of course that I already had the fabric, and her skirt is satin in the parks. Stupid princesses. It was so nice doing the embroidery for Anna because she doesn't wear satin! Someone needs to remind me of this before I find myself working on another princess. I also got about 2/3 of the lace sewn on around the neckline of the bodice. It went quite quickly, once I actually sat down to do it! I think I should be able to finish the lace on the bodice, and finish pinning the skirt hem tonight. I might even have time to sew the skirt hem, which would be nice. So much for bringing a bunch of hand-sewing work with me to LA this weekend. I got almost none of it done. However, last night, I did finish whipping down the piping on the bodice, which means it is now ready for me to hand-sew all the lace around the neck and hem. I also picked out all the stabilizer from the skirt embroidery, which I finished on Friday, so it is now ready for the pink ribbon trim around the edges. I haven't been in the mood to bus-sew (I think the bodice is just a little too cumbersome, with all the boning in it already), so while I'd love to get all that done tonight, that might be a bit of a reach. In the meantime, an embroidery picture. I don't know what I was thinking before, when I thought I only had two embroidery motifs left to do. Apparently I'm blind and/or crazy. Somehow, I must have gotten it into my head that it was a three panel skirt, which it most definitely is not. So the good thing is, my embroideries are not going to overlap. The not so good thing is that I still have three motifs (plus probably the little filler in the CB, plus probably those half motifs at the tops of the CFs) left to go. I only got one motif done last night, because my friend had a lovely spur-of-the-moment birthday party, which was much fun. So basically, there is no chance that the skirt will be coming with me to LA for hand-work. On the plus side, I did finally decide on my boning for the bodice. I'm going with flat steels everywhere except under the arm, where I'm using the spirals. I sewed off the ends of the boning channels (breaking two needles in the process, of course), and machine-sewed the piping to the bottom of the bodice. If I have time tonight, I'd like to make the "faux blouse" section that goes in the top of the back, because sewing that in is more hand-sewing. That way I'll have one side of piping, two sides of lace, and the filler to be able to work on during the trip. No pictures today, sorry. Though can anyone else tell me if they can see the picture from yesterday? Apparently it was visible, and as of last night, it wasn't. Clearly I'm going to have to figure out a different photo host than google. On the plus side, I haven't run out of pink thread yet, so I'm kind of thinking I might be able to make it through the last two motifs. I think I have about 17" of pink thread stitching left? Please keep your fingers crossed for me! 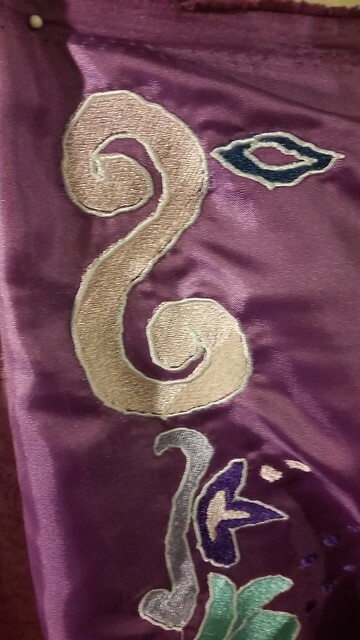 I think I might be able to actually start on skirt assembly tonight, after I finish the embroideries. Though I also have to pack for my LA trip this weekend, so who knows. But I'd really like to be able to get the skirt on its waistband, because then I can see how the bodice looks with it, and finish that up. If I can make the bodice boning decision and machine sew the bottom piping on by Friday night, then I can take the bodice and all the lace with me to sew on the plane. There's a lot of handsewing that needs to be done with the skirt, too, so maybe I can even get to that point with the skirt as well? I hope so! Here's another really crappy pic of my skirt embroideries so far. I got three more motifs done last night! I also managed to whip down most of the piping around the neckline. And I went to Joanns and bought stabilizer, more bobbin thread, and the ribbon trim for the skirt and sleeves. Now I just need to worry about running out of the pink embroidery thread! And unfortunately, the only store that carries it closes by 6pm, which is before I get home. And I will be in LA this weekend, so I can't go shopping then either. Fingers crossed for me, please! Here's a pic of the skirt. Both of the fronts are basically done, though I might see about chopping one motif in half and putting it at the top. I have one motif on the hem so far. No Hanukah miracle for me. I did more embroidery last night (I think three motifs more), and I have enough stabilizer left at this point for one more motif. Oh well, off to Joanns I go. I need to get ribbon and lace for the trimming anyway (because despite the fact that I feel like I have a million different types of lace, none are what I actually need), so at least it's not just for one item. I also put the new piping on the neckline, and started whipping down the edge. I actually didn't take the bus today, for the first time ever, but if I don't finish it while the other machine is embroidering, this will become bus sewing tomorrow. I need to wait to do the bodice hem piping until I can decide on the type of boning I'm using. Anyway, here's a pic of the embroidery so far. I haven't pressed this or even removed all the stabilizer yet, so hopefully that explains the wrinkles.